As you all know, or not, this style originated from South Korea. Oh yeah! You can read more about it here. 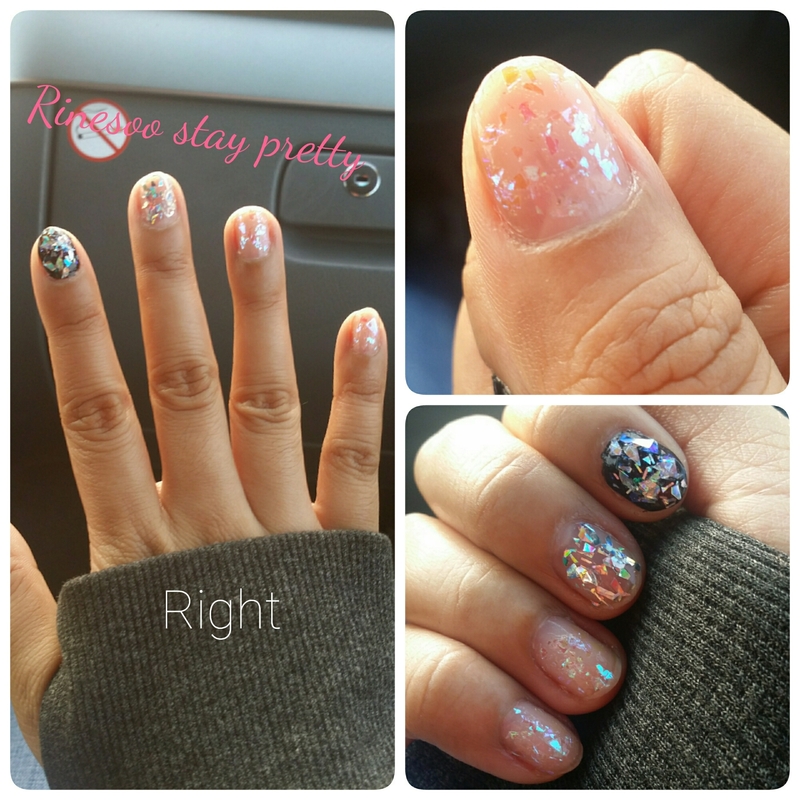 The concept is pretty easy, you cut small pieces of this pearlescent looking foil and apply it on your nail and then apply a top coat. Sounds easy right? Well I bought some film from Etude House and I found it pretty hard to do, plus you need to be quite precise with this and patient. 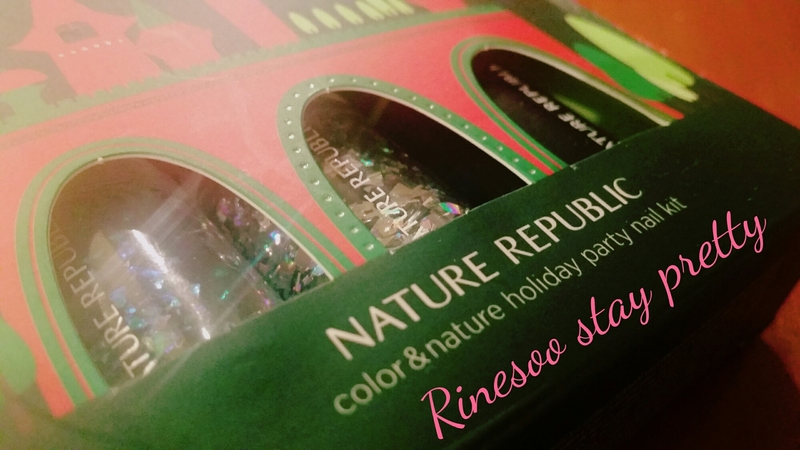 So when I saw that Nature Republic came out with a set, I had to get one… and find the cheapest place to get it. 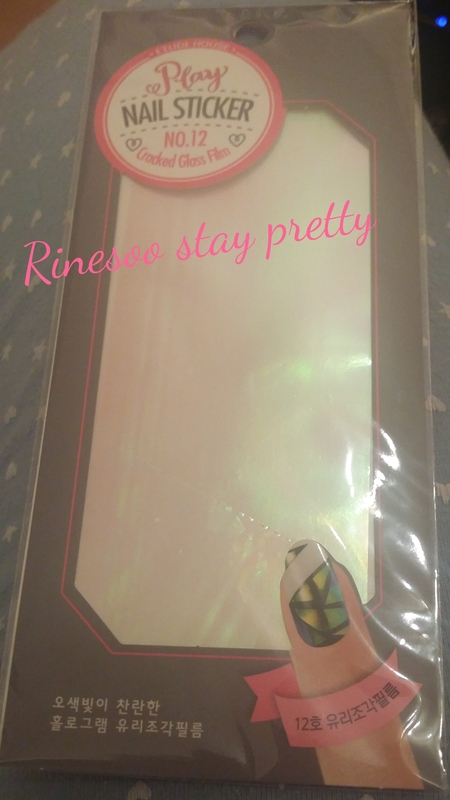 And I found it on Cosmetic-love for 9$ shipping included! My order was placed. 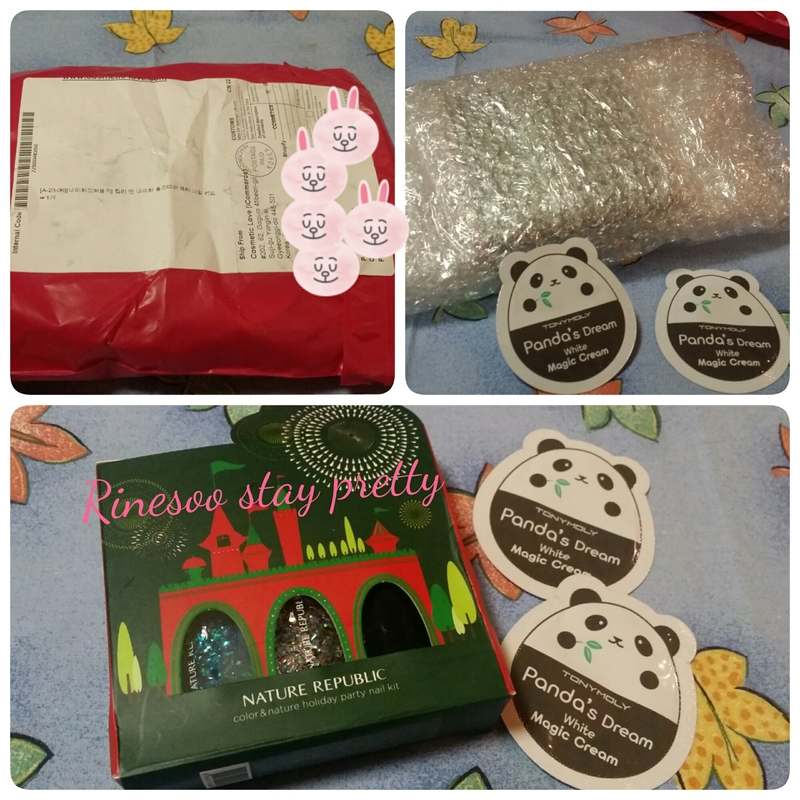 I placed my order on Cosmetic-love and it arrived in less thank 3 weeks. It came in a cute pink envelop which was nicely packaged and got 2 samples from Tony Moly. 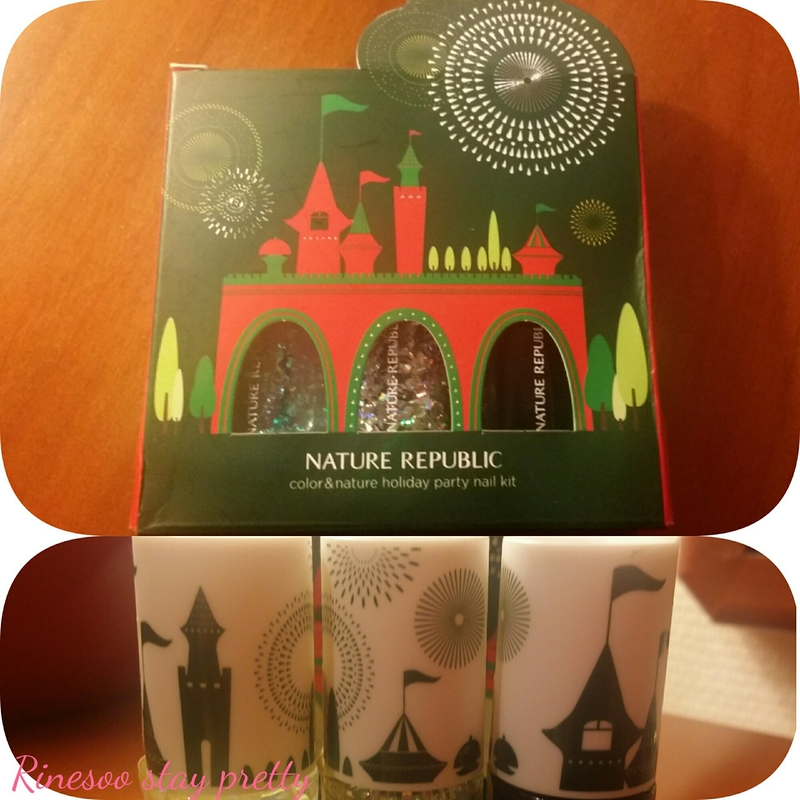 The nail glass kit comes in this cute green box with a castle design. When opened, you have this mini drawer with the 3 nail polish bottle. These are not mini bottles as each contains 8ml. 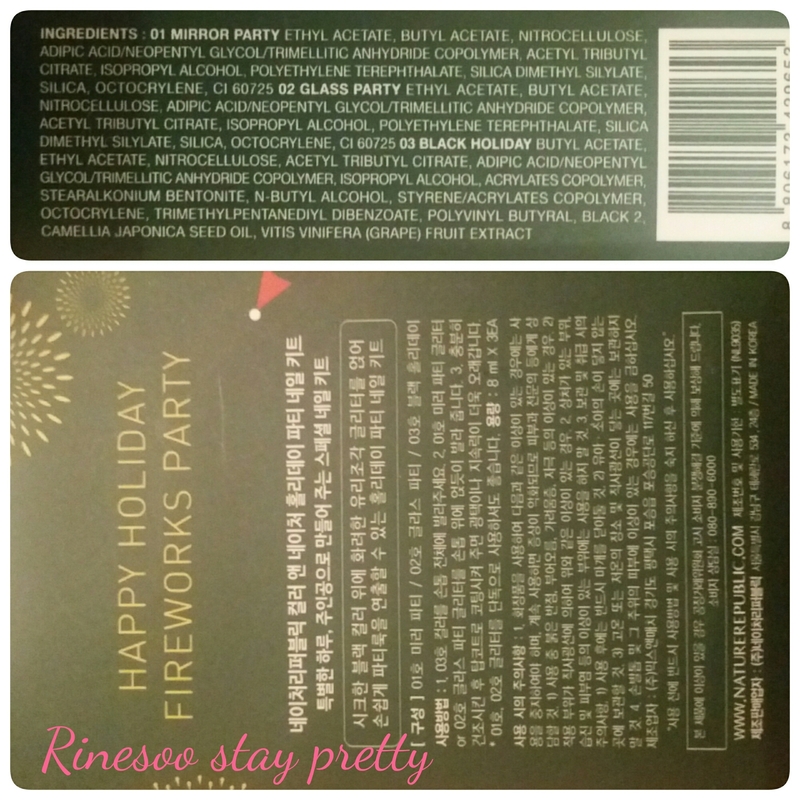 Most of the writing on the box is in Korean, you can find the English explanation on the bottom of the box : you have the name of each nail polish and the ingredients. 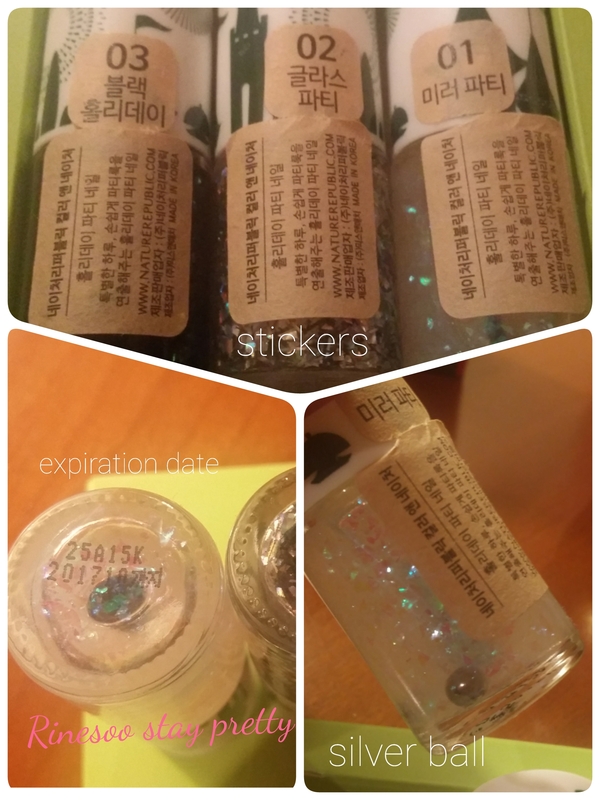 On the back of each bottle, there is a sticker in paper with more explanation and the name of the shade in Koream. On the bottom there is also a mentioned date, which is possibly the expiration date … not sure though. You can also find some silver balls inside the bottle to be able to shake it and mix it. 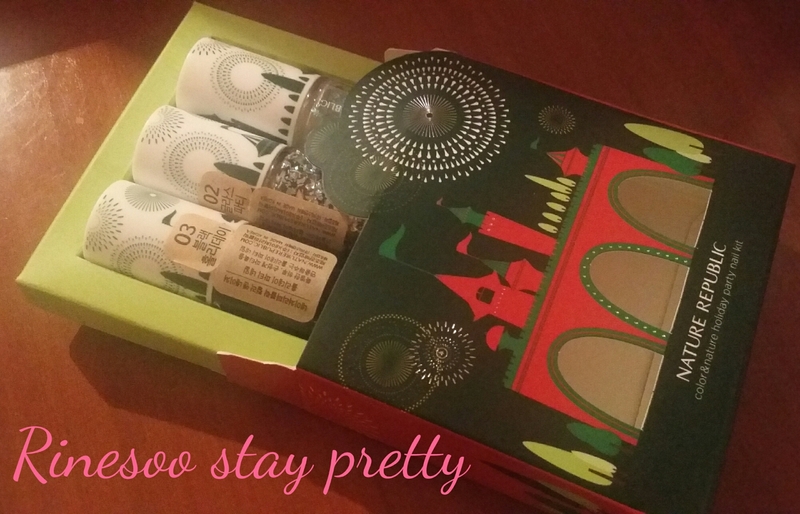 You’ll also find the design on the box replicated on the caps of the nail polishes. 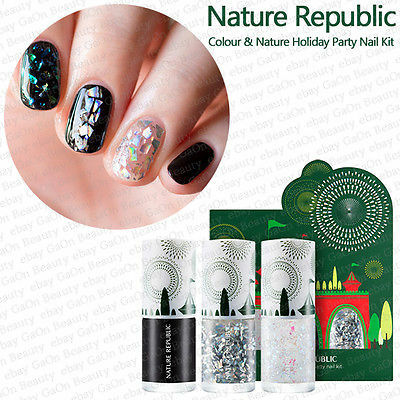 From the design of the box, I’m guessing they want this nail kit to replicate firework with all the glitz. 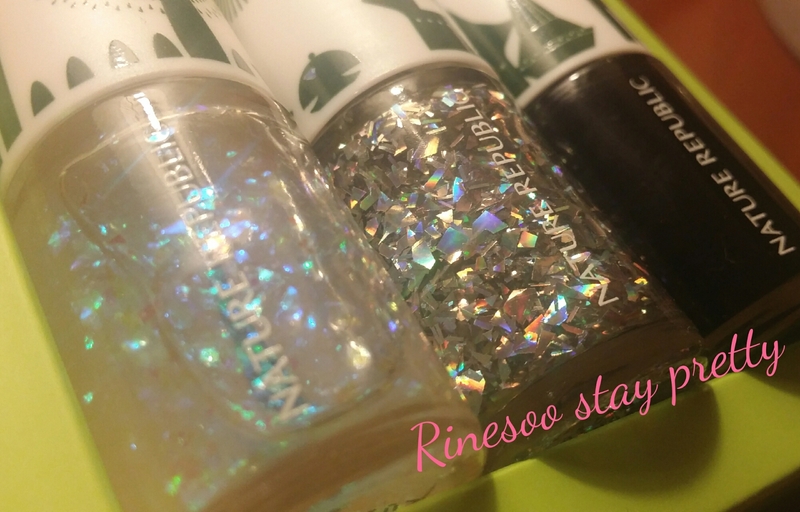 The mirror and glass have more of a syrupy texture and the black nail polish has a nice consistency between watery but spreadable. This is what it supposedly should look on your nail. Let’s see if it’s that easy to get the look. So I finally decided to try this, and it wasn’t that easy. 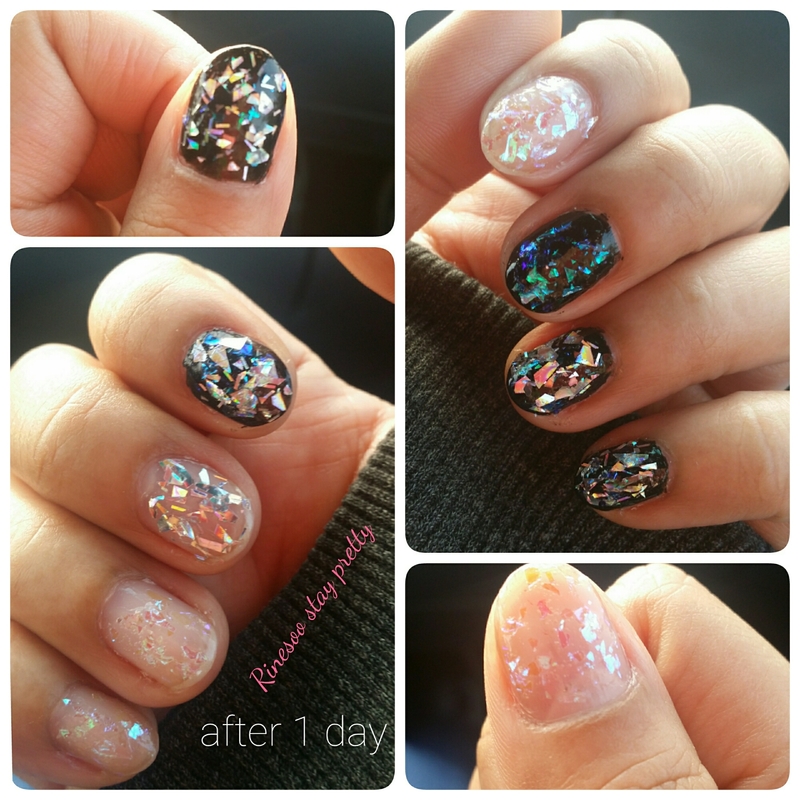 I had to apply it in several layer just to get some bling on my nails. Then because it became too thick, the nail polish became too sticky. I tried it without any undercoat or top coat, to see how resistant it would be. 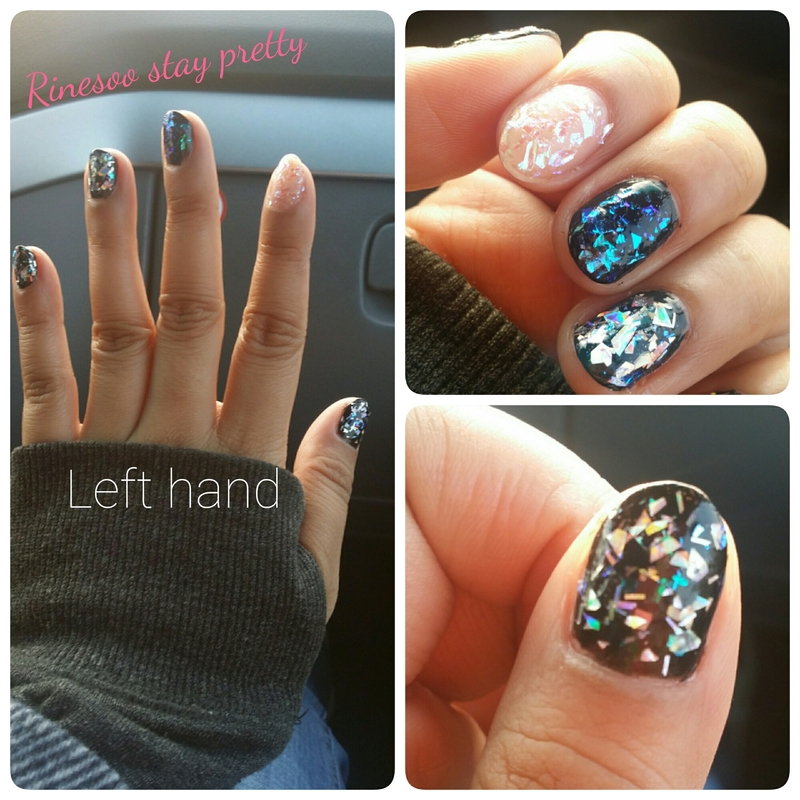 Here is my left hand : I think it looks quite pretty, specially the mirror party on top of the black nail polish. Here is my right hand. Applying just the top coat is also quite pretty. Because I didn’t apply any top coat, my nails were pretty rough to the touch. Some of the “glass” were sticking out and fiber kept getting caught on it, from my scarf more specifically. It was quite annoying. Some of the bits were sticking out quite a lot, that I was tempted to pull it, which I did quite a lot. After 5 days, here is the status of my nails. A lot came off. It could be because I applied a quite thick layer of nail polish, it started peeling of and damaged my nail. Some part, like the nails on my thumb stuck it out until I finally removed everything. These nail polish are pretty hard to remove because of these big “glass” bits . I really had to apply a love of nail polish remover just to get my nails clean again. Well even though I didn’t apply it properly, this nail design still looks really good. It’s so out of the ordinary. My favorite of the 3 is definitely the 01 mirror party. It could make any nail polish pop and make it more interesting. This kit did make it a bit easier to get the glass nail look, but if you want it to look like the box, you should not apply it directly with the nail polish brush. You should still take it one piece at a time with those nail design sticks. Top coat to seal the design is highly recommended as well, to have nice and smooth nails to the touch. 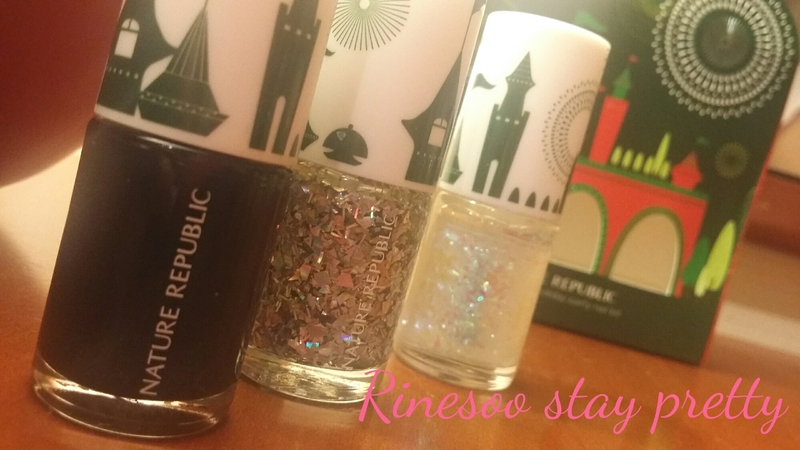 Price wise, this is such a good buy : you get 3 full size nail polish of 8ml for less than 9$. The film I bought from Etude House was already 4$, and that was only one type. You can always practice to get the look. From what I understood, this was a special collection for the holidays. I suggest you get this before it’s off the shelves completely. 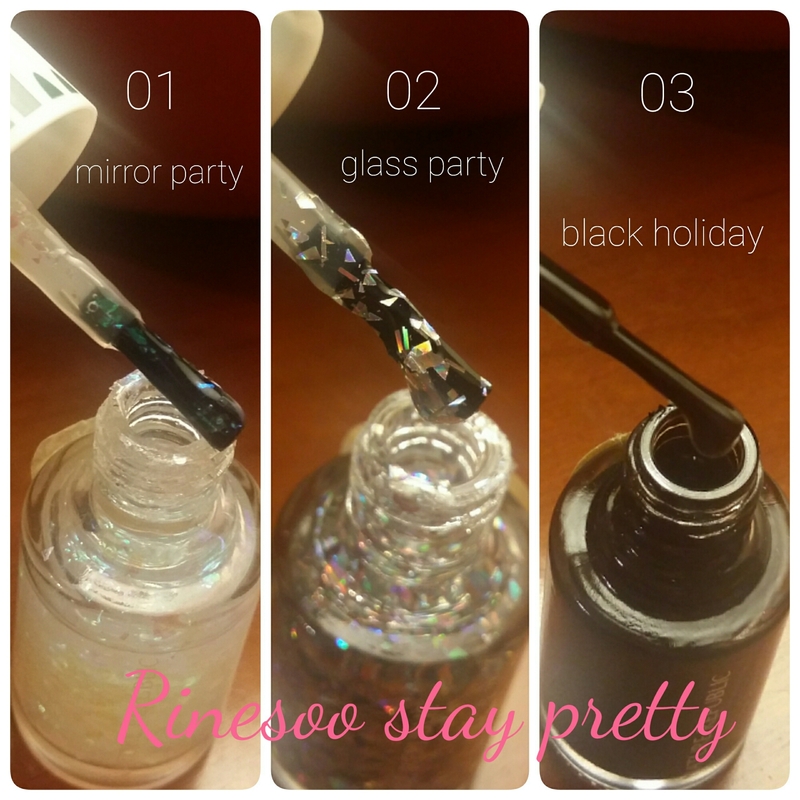 If you want to try the glass nail look at home, do try out this kit. The only store I found that sells this is Cosmetic-love. Do let me know what you think of this look. Do you like it or have you tried this before?